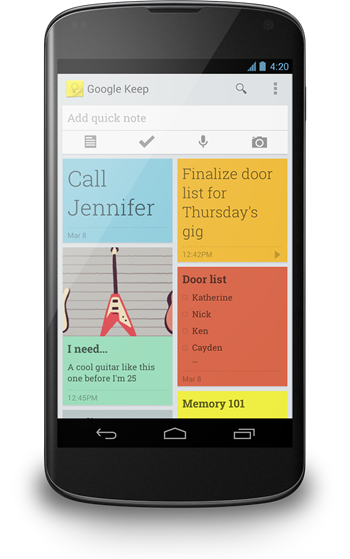 After briefly making an appearance just two short days ago, Google Keep is now alive and kicking, officially this time, after the service went live following a blog post by the company. Over on the official Google blog, software engineer Katherine Kuan announced the arrival of Google’s Evernote-like service, while also claiming that the service itself will be changing over the coming weeks. Originally turned on for a brief period a couple of days ago and then pulled, Google Keep is Google’s take on the humble note-taking department. With Evernote arguably the king of the note-takers, Google has adopted a similar strategy to the current owners of the market, with Keep promising to be the place where we dump all our stuff for retrieval later using, as is to be expected, Google’s fancy search features. Keep also appears to aim to be a list making solution, too, possibly eating into the market currently filled with the likes of OmniFocus and Things. Keep itself is heavily tied to Android currently, with an app already available in the Play Store and a lock screen widget getting data into Keep as easy as pie, something that has always been a barrier for many people’s note-taking exploits. 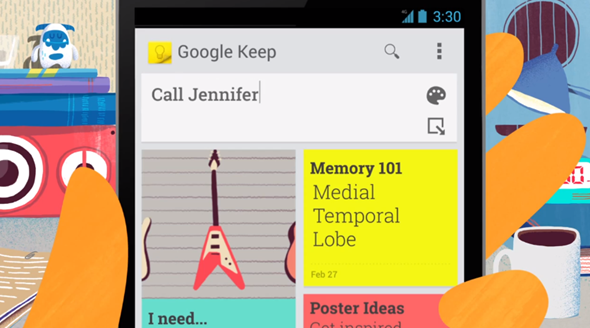 It needs to be easy to get notes into Keep, and Google seems to know that. There is also the web based element to Keep that we would expect from Google, with the web app to be tied into Google Drive more closely over the coming weeks, according to Kuan. Drive will be the powerhouse behind the service, which also comes as no surprise. Unfortunately, we’ve been unable to test Keep ourselves due to what we assume are scaling problems within Google. We’re currently being met by all kinds of server-side errors when trying to load the Keep website, and we’re hearing similar things across the web. But we’re expecting things to settle down eventually, so hold on to your horses before tossing out those complains. There has been no word yet on an iOS app for Keep, so we don’t know whether Keep will get its own bespoke app, or whether Google will decide to lump it into the existing Google Drive app. Hopefully it won’t be too long before we get to find that out. To give Google Keep a shot on the web, simply point your web browser to Drive.Google.com/Keep or download the Android app from the link given below.